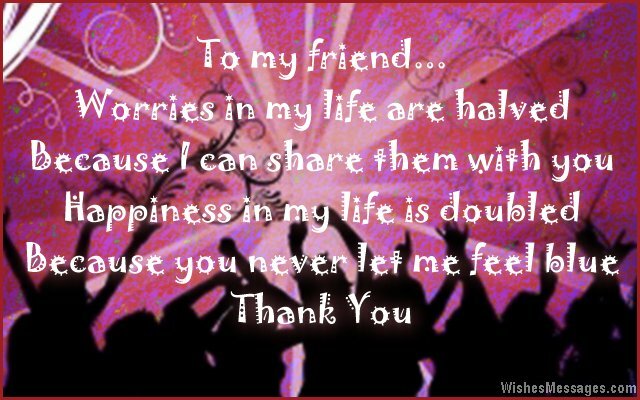 Thank You Messages for Friends: Friendship is too precious to be celebrated with a measly greeting card on Friendship’s Day. Make every day count and keep poking your besties with cute texts, tweets, pins on Pinterest and posts on Facebook. From handwritten notes that touch the heart to funny doodles about crazy stuff you’ve done together, let your friends know how much you appreciate them for all the support, advice, hugs and smiles. Childhood besties, bffs in school, college roommates or colleagues at work – all these people hold a special place in your life’s memory bank. Stop waiting for birthdays and other special moments to write a sweet note for them. Take ideas from this post to find the right words to randomly say Thank You to your friends for everything they’ve done for you. 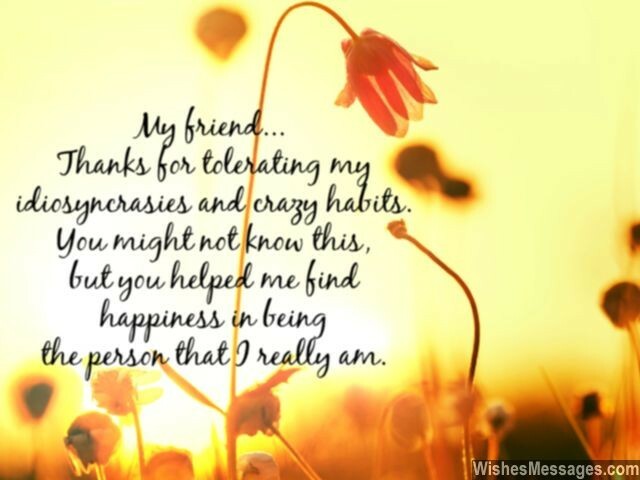 1) My friend… thanks for tolerating my idiosyncrasies and crazy habits. You might not know this, but you helped me find happiness in being the person that I really am. 2) The secret to lifelong friendship is to treat is not just as a gift, but also as a responsibility. Thanks for playing your part to perfection. 6) It’s ok if you don’t have too many friends. 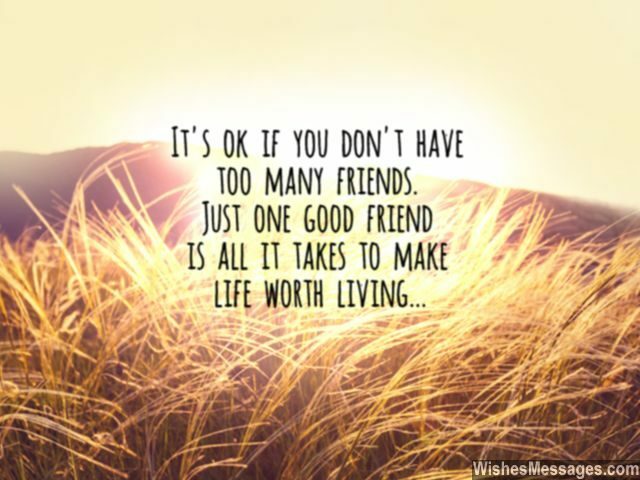 Just one good friend is all it takes to make life worth living. 7) There is no one with whom I can share my tears and fears, if you were not here. Thanks for being by my side, and always giving me reasons to cheer. 9) I would rather thank you time and again for being a wonderful friend in every way, than belittle our friendship by saying thanks only once a year on Friendship’s Day. Thank you. 12) Best friends are those who keep giving, even when you have nothing to give in return. Thanks for being one. 13) Throughout my life, everyone could see the tears in my eyes… but only you could feel the pain in my heart. Thanks for being my friend. 14) I don’t know what loneliness means, because sad and alone, I’ve never been. Through all of life’s murkiest corners and bends, I’ve always sailed through, because of you, my friend. Thanks. 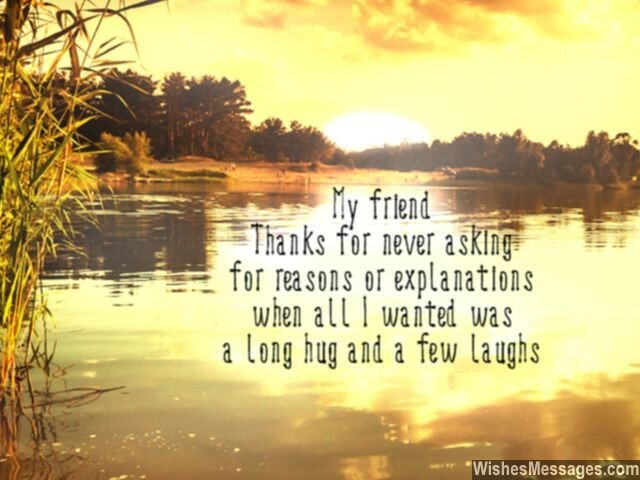 15) I don’t know how I can say thank you to a friend who understands the all the things I never say and never says anything I don’t understand. 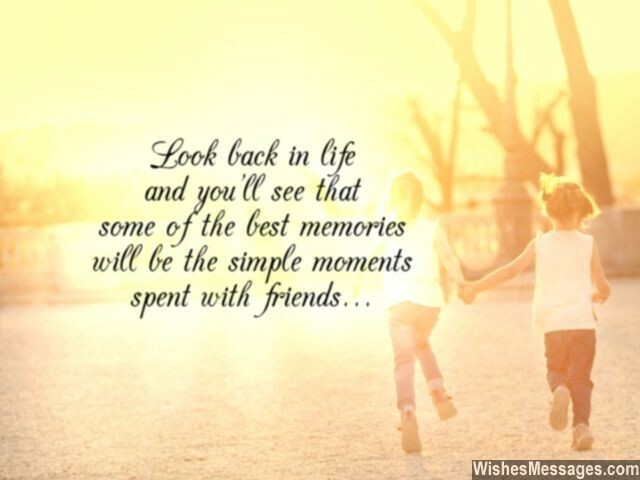 16) Look back in life and you’ll see that some of the best memories will be the simple moments spent with friends. My friend, I owe you tons for giving me a pool of awesome nostalgia. I miss you. 17) I would rather thank you right now and today for being such an amazing friend, rather than regret not having said these words to you after life’s journey comes to an end. 18) I never get ruffled even when I have troubles coming my way, because I know that you are just a phone call away. Thanks. 19) My dear friend… thanks for walking with me when I needed support, thanks for walking ahead me when I needed guidance and thanks for walking behind me when I needed someone to watch my back. 20) Whoever said that diamonds are a girl’s best friend, obviously never had such a cool friend like you. Thank you for being my bestie. 21) I don’t have any wishes in life. As long as I have friends like you, I’ve got it all. 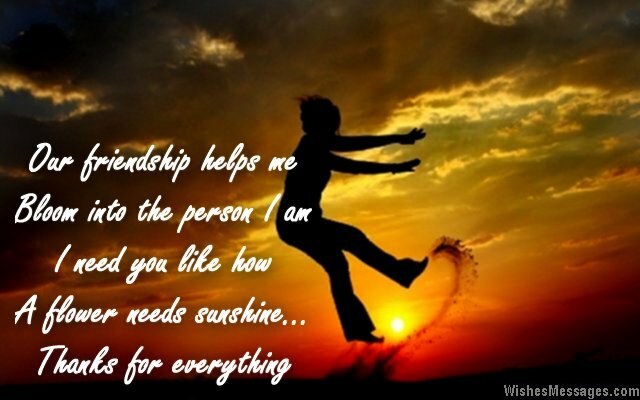 22) Thank you for being the friend that I always wanted, needed and appreciated. 23) Just like how a rainbow has no value without its bright colors and a perfume has no value without its fragrance, my life has no value without a friend like you. Thanks for being my friend. 24) We are truly Best Friends Forever because I can’t remember when our friendship began and I know it will never end. Thanks. 25) Your presence lightens up my sky like the crimson rays of the morning sun. Being around you makes even dull and boring moments seem so fun. Thanks. 26) You make happiness worth sharing and you make my dreams worth believing. Thanks for being by my side and making my life worth living. 27) My friend… thanks for showing me the dreams that I didn’t have the courage to see myself. 28) You’re less of a friend and more of a mirror that hides my weaknesses and highlights my strengths. Thanks. 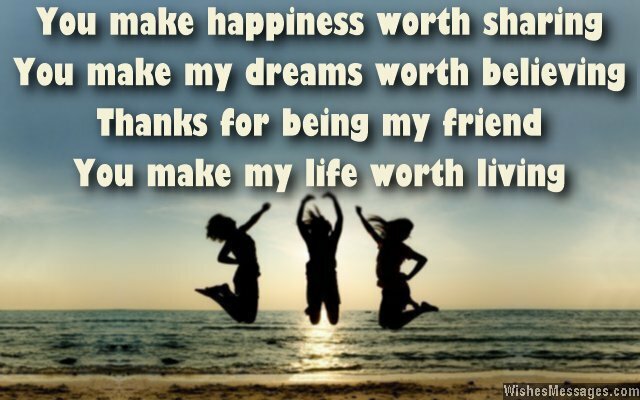 30) The best part of having a friend like you, is that I always have happy days to look forward to. Thanks mate. 31) Worries in my life are halved because I can share them with you. Happiness in my life is doubled because you never let me feel blue. Thanks. 32) You’re my BEST friend because some of my life’s BEST memories would exist if it weren’t for you. Thanks. 33) Today I want to declare, that your friendship is worth more than millions of likes on Facebook and hundreds of thousands of retweets on Twitter. 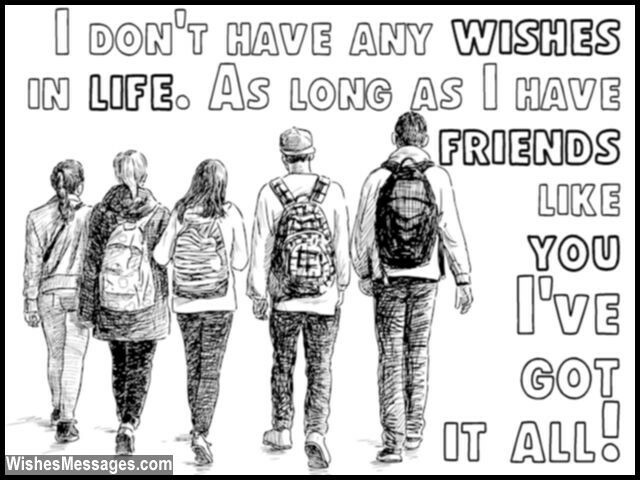 Thanks for being a REAL friend. 34) You have been the foundation of our friendship, my pillar of strength and the wall which shields me from every sorrow. If you were a house, I could live inside you. Thanks bestie. 35) My friend, thanks for being with me through thick and thin. It’s because of you that in life, I always score a win. 36) Our friendship helps me bloom into the person I am. I need you like how a flower needs sunshine. Thank you. 37) If friends like you came with price tags, I would have been a millionaire. You’re precious and our friendship is priceless. 38) You gave me your shoulder to lean on when I was down, a piece of your mind when I was acting crazy, your hand to help me move on and your heart to heal all my worries. Thanks for giving everything, for our friendship. 39) Living life without a friend like you would be like celebrating Christmas without Santa Claus or Easter without a chocolate bunny. Thanks for making my life a true celebration. 40) The way you help me solve all the problems in my life, sometimes I think that you are a fairy in disguise. Thanks for everything.